Several varieties of trees compete to grow and spread their seeds in the sunlight of this small, but fertile, forest. As each tree grows its leaves are touched by the sun's rays, collecting Light Points and casting shadows on the surrounding smaller trees. When a tree reaches the end of its life cycle, players win points proportional to the richness of the soil the tree was rooted in. Using your light points, take your trees through their life cycles, from seedlings to fully grown. Then, collect Scoring Tokens with points proportional to the richness of the soil on which the trees grew. A Set the main board in the center of the table. B Give each player 1 Player Board, 1 Light Point Tracker, 6 Seeds, and 14 Trees: 8 small, 4 medium and 2 tall (matching the tree variety on their Player Board). C Stack the Scoring Tokens in 4 piles (according to their shade of green and number of leaves) next to the board, in descending order so the highest scores are at the top of each pile. 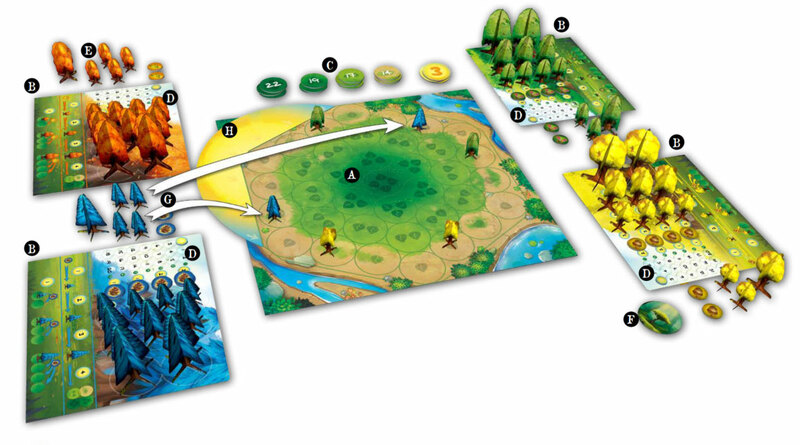 D On each Player Board place 4 Seeds, 4 Small Trees, 3 Medium Trees, and 2 Large Trees on the corresponding open spaces. Then, set the Light Point Tracker on "0". 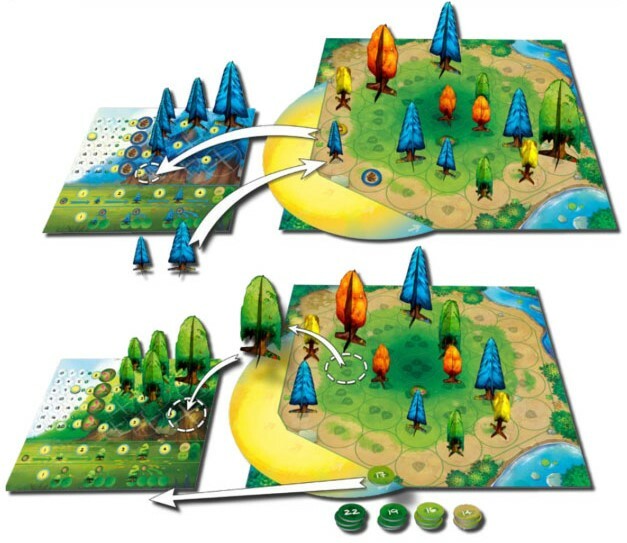 E Place the remaining 2 Seeds, 4 Small Trees, and 1 Medium Tree alongside each Player Board; these are the seeds and trees available to each player at the beginning of the game. F The youngest player starts the game, making sure to take the First Player Token. 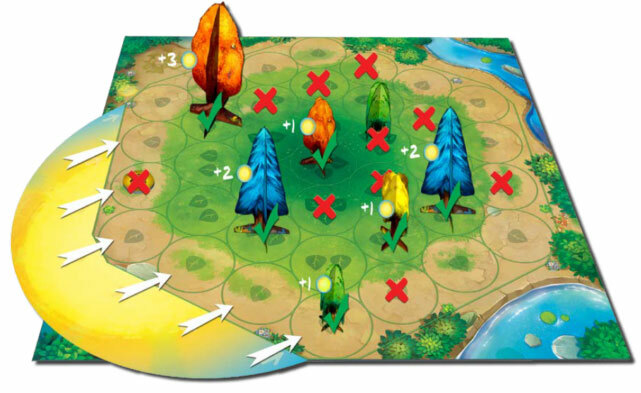 H Taking turns, players place 1 of their available Small Trees on a space of the external edge of the main board (the 1 leaf zone). Taking turns again, they place a second Small Tree. 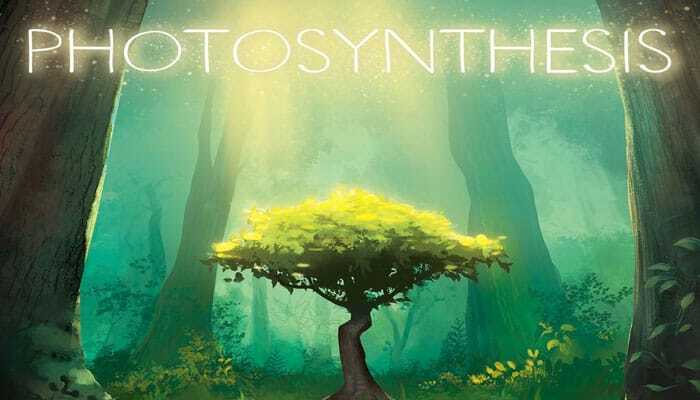 This will allow players to collect Light points during the first Photosynthesis Phase. H Finally, place the Sun Segment on the sun symbol printed on the board (making sure there is enough space around the board to move the sun freely to each of the 6 positions). To keep track of the sun's revolutions, set the 1st, 2nd, and 3rd Revolution Counters on the edge of the board in numerical order. Unless playing the advanced version, leave the 4th counter in the box. 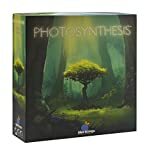 2 player game: Leave the 3 darkest green Scoring Tokens that have 4 leaves printed on them in the box, they will not be used. When players collect Scoring Tokens from the middle 4 leaf space, they instead take the tokens from the 3 leaf stack.the 4th counter in the box. The player with the First Player Token moves the Sun Segment clockwise, to the next angle on the hexagonal board. Note: this step is skipped during the first round of the game. Light points are then counted based on the new position of the sun. Players get light points for each tree that is not in the shadow of another tree. Players add their light points to their Player Boards by moving the Light Point Tracker. No points are scored for seedlings. In this example, the orange trees earn 4 light points, the blue trees earn 4 light points, the green trees earn 1 point, and the yellow tree earns 1 point. Once all light points have been counted and scored, the round continues clockwise with whoever is in possession of the first player token. Players are then free to spend their light points on any number of actions, and can choose to exhaust their light points, or only use a portion of them (keeping those leftover for future rounds). Each player carries out all the actions they wish to do during their turn before it is the next player's turn. Important: During their turn, a player cannot carry out more than one action on the same space on the main board. Once a player has acted upon a space on the main board, that space is considered activated and cannot be used again by this player on that turn. Players can use their light points to purchase seeds or trees of any size from their Player Boards. The numbers next to them correspond to their value in light points. They must buy from the bottom of the board up, in any column (from the least to the most expensive). Once a player has bought the pieces needed, and subtracted the value in light points using the tracker, the pieces are moved to the available area next to the Player Board. Note: The 2 Seeds, 2 Small Trees, and 1 Medium Tree left in the available area at the end of the set up are available to plant without buying, in future rounds. Any other seeds and trees a player wishes to use from their Player Board must be bought, and then placed in the available area. Players can plant a Seed around one or more of their trees, using one light point per Seed. A Seed from the available area can be planted at a distance that is determined by the size of the tree from which it originates. You can plant a seed in any direction, including nonlinear directions, as long as the spaces connect. Planting a seed activates the tree of origin's space, as well as the space the seed is placed on. Therefore during their turn a player cannot plant more than one Seed originating from the same tree. Additionally, they cannot grow a tree from one size to the next, and then plant a Seed using that same tree as its origin. A seed or tree can be replaced only by a tree that is the next size up. 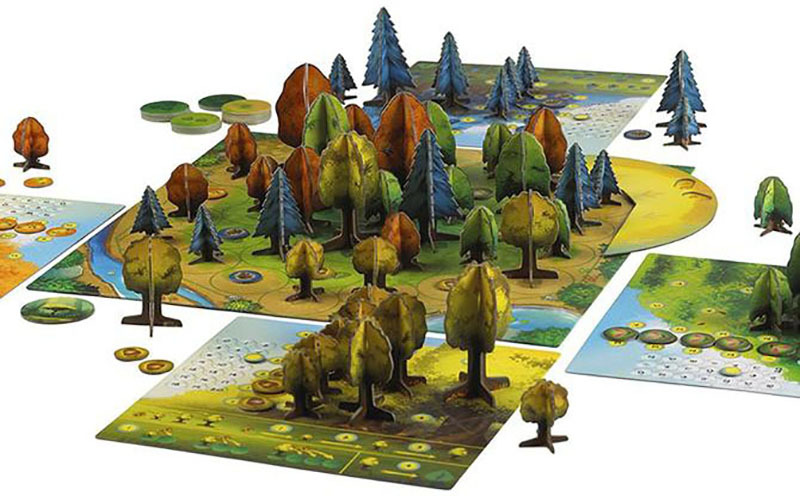 Players can only take new trees from their available area to grow seeds or trees on the main board. 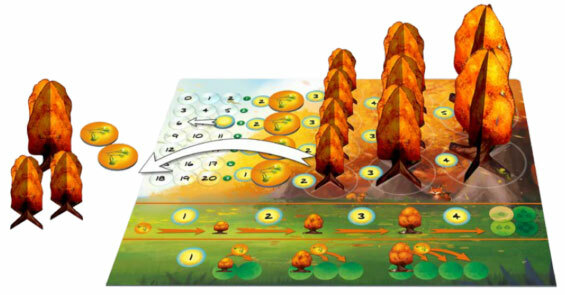 Trees and seeds that are removed and replaced from the main board are then placed on the Player Board, on the topmost available space. If no corresponding spaces are open, the trees or seeds are discarded into the box for the remainder of the game. Players can choose to collect Scoring Tokens by ending the life-cycle of their Large Trees. To do so costs 4 light points per Large Tree. The Large Tree is removed from the main board and placed on the topmost available space of the player's Player Board. The player then collects the Scoring Token that is on top of the pile that matches the soil type of where the Large Tree was rooted. If there are no tokens left in that pile, the player takes the top token of the next pile (Example: a player takes from the 2 leaf pile if the 3 leaf pile is gone). Once a tree has been collected, other players are free to plant in that space during that round. Reminder: All of the above actions, except buying, activate a space on the main board (meaning you cannot act upon it again during your turn). This means that during your turn you cannot, for example, plant a seed and then grow it, grow a tree and then use it as a point of origin for a seed, use a tree as a point of origin for a seed and then grow it, or collect a tree and plant a seed in its space. 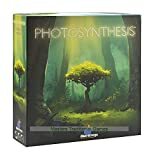 After all players have taken a turn, the First Player Token is passed on to the next player, clockwise, and a new round starts with the Photosynthesis Phase. When the sun has completed one revolution around the board, the top token of the Sun Revolution Counter pile is drawn and placed in the box. The game ends when the sun has completed three revolutions around the board, and the last Sun Revolution Counter has been drawn. A full game is 18 rounds, with the last round occurring at the 6th position of the sun (the one before the sun symbol printed on the main board). Players then count the points on their Scoring Tokens. They also add 1 point for every 3 unused light points (0-2 light points do not score any extra points). The player with the most points wins the game. In the event of a tie, the winner is the player with the most seeds and trees on the main board. If there is still a tie, both players win. Include the 4th Sun Revolution Counter, giving the sun another revolution around the board. Players cannot plant a seed or grow a tree when that seed or tree is shadowed by another tree.